This is very easy to make especially if you have frozen shredded coconut. It tastes best with fresh coconut though. Grind coconut, channa dalia, red chillies and salt. Heat oil in a small pan and add the seasoning ingredients. Once the mustard starts to splutter add to the ground coconut mixture and serve with dosa or idli or vada. 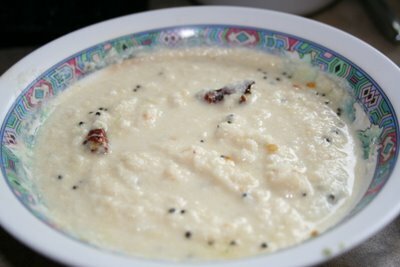 Nice recipe.. My mom used to make this but I had forgotten the proportions and the last time i tried, it ended up tasting more like a dal chutney.Thanks. Yes Shaheen my first try i made that mistake too. Anyway you can taste it and add more coconute if you want and grind once more. pl help me to make dry cocnut chutney as fresh cocnut is not always available where i stay. i saw this site, really good. Sritalli: Sorry for the late response. You can buy frozen coconut either in shredded form or powder form from Indian grocery shops. Add some hot water to it to rehydrate this and then make chutney as normal. This softens the coconut and grinds it to a fine consistency. Hope this helps.